Consider the table below and the non-target impacts of pesticides in your pesticide decisions. 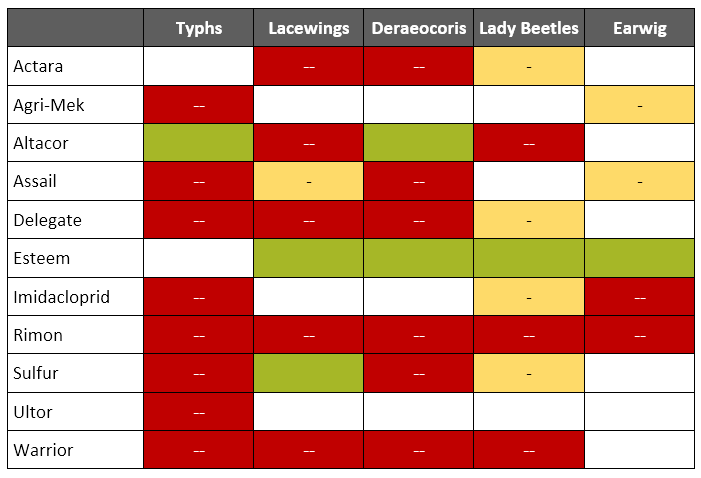 Red (–) indicates negative non-target impacts on natural enemies, yellow (-) some effect, green little negative impact. WSU Crop Protection Guide 2017. Good coverage of both sides of the tree where the volume of water is sufficient to thoroughly wet and cover the tree (110+ gal/acre) are always important for good pesticide efficacy. Surfactants help achieve better coverage. Alternate row sprays are not recommended. Remove 1-2 large branches per year for renewal. Pruning that is too aggressive will result in excess vigor the following year. Water sprouts are the only source of succulent leaves in June for psylla. Remove water sprouts before they develop woody attachment to limbs, normally before the end of June. Pear trees should receive the minimum nitrogen fertility to maintain proper tree and fruit growth. Over-fertilization can extend terminal growth and delay hardening off. This provides optimal late feeding conditions for psylla.